Don’t Starve released to widespread acclaim back in 2012, and has continued to grow and expand since then. To date, it has spawned three expansions, a multiplayer version and many, many console re-releases, and all of them are fully deserved and entirely necessary because, quite simply, Don’t Starve is the greatest Rogue-like and possibly the greatest game of all time. The Rogue-like genre finds its beauty in level generation and its infinite replayability; Don’t Starve takes this idea and sprints off with it like The Flash after fifteen cans of espresso-infused Red Bull. There’s a plethora of options to customise the world that the game will generate even before you start: you can eliminate monsters entirely to make the whole experience easier; you can turn the world into a snowy tundra with zero sunlight to make travelling more difficult; or you can customise the world to make exploration easier and more fulfilling – the possibilities are absolutely limitless. My sister creates maps with nearly infinite food and few monsters, allowing her to play Don’t Starve as a kind of farming simulator, while I stick to the default or create maps based on specific challenges I set myself. In and of itself, that illustrates Don’t Starve’s incredible versatility: it’s a game that gives you the power to create entirely new games within its framework, based on exactly what you want to get out of it. Of course, you are still limited to the building blocks that the game provides, which is why it’s so vital – and so impressive – that Don’t Starve balances them perfectly. Everything interacts with everything else, and while it might not always be clear how, it follows a certain logic. To that end, your every action has consequences; forcing you to take those into account creates a balancing act that means that it doesn’t have to throw a huge amount of obstacles at you, since you’ll eventually start creating them yourself. You might think it smart to bring some flowers back to your base for a quick sanity boost only to find it infested with bees come summertime, or bring a flock of Smallbirds back to serve as bodyguards only to have them wreak havoc when they grow into Tallbirds. Forcing you to plan ahead for situations like these is a large part of the challenge, and it’s what keeps the game so fresh even after your thousandth game. Rogue-likes as a whole are extremely popular at the moment, and it’s easy to see why: it offers endless replayability by design and it lets you play for as long as you want – whether it’s 20 minutes or 20 days – rather than locking you into a story, getting you interested, telling you where to go and what to do, and then just cutting you off. 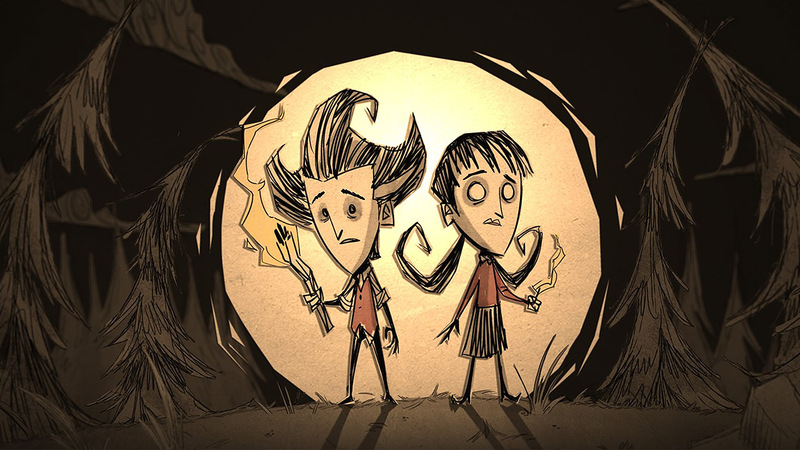 Don’t Starve got in early and absolutely nailed it, and rather than rest on its financially-comfortable laurels, developer Klei Entertainment put in more work to grow and expand its game into something truly beautiful. If you haven’t had a chance to play it yet, Don’t Starve is on nearly every platform you can think of, it’s got a very reasonable price tag for what it is, and I cannot recommend it enough. Klei is a brilliant developer that deserves every accolade it gets. Klei-mazing.